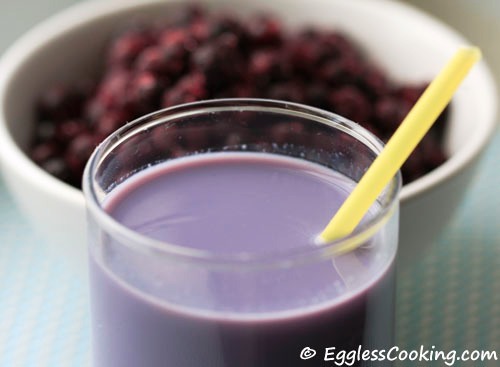 How to Prepare Blueberry Juice and Blueberry Flavored Milk? My son is 3 years and 3 months old and like many kids of his age he is also a picky/fussy eater. Meal time is definitely a battle time. The problem with him is, he doesn’t have a favorite food. If he had a favorite food, I would simply prepare it for him everyday until he is bored. Earlier broccoli, cauliflower and pasta were his favorite. But not anymore. I think I’m never going to understand his mind in this matter. I have a very good desi neighbor, whose daughter R is also my son’s age. She also stocks up a lot of fruits and when my son goes there she offers him a fruit and he eats it very quickly without hesitating. So what I do, the very same evening I ask my husband to pick up that fruit on his way home and I give it to my son for breakfast the next day, and he disappoints me by not even taking it to his mouth. Last week I bought cherries for the first time, to try a cake recipe. I was sure that he is not even going to taste it. I was removing the pit in the cherries and I gave him one and he ate it and asked for some more to my surprise. This continued for sometime, I was pitting and he was asking for more. So what do I do, I don’t proceed with the cake. I simply put it back in the fridge and offer it again the next day and you know what, he didn’t even eat one piece. Kids, definitely have their own thought process and they want to show us that they are in control. Now here comes the rescue in form of a book called “The Sneaky Chef” by Missy Chase Lapine. 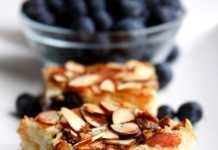 She discusses about various simple strategies for hiding healthy foods in kids’ favorite meals. She masks spinach and blueberries in brownies, cauliflower in Mac and Cheese, cherry juice in chocolate milk, white bean puree in chocolate chip cookies, etc just to mention a few. This book has definitely made me think outside the box. I started with the cherry chocolate milk recipe first because he drinks chocolate milk daily in the afternoon after his nap and we had cherries at home. I’ll post this one shortly. Just as it was mentioned in the book, neither of us were able to taste the cherry juice in the chocolate milk. Both the flavors blended so well. So I decided to try the blueberry flavored milk next. The blueberry juice when mixed with the milk gave a nice violet color. But it was not sweet enough, so I mixed in some maple syrup. I liked it very much. Of course, you will get a mild blueberry smell. I was really excited to see a purple colored milk, more than he was and I asked him if he wanted to drink purple color milk. He too agreed without fussing, but once he tasted he said that it’s not nice. So I had to get him all excited about the color, but no, he wouldn’t drink. A very simple recipe to prepare blueberry juice using fresh/frozen blueberries and for preparing blueberry flavored milk. As per taste Maple Syrup or sweetener of your choice. Mix together all ingredients and serve it. Boil together the berries, water and sugar. Turn heat to low and simmer for another 10 minutes. The original recipe instructs to mash the berries with the back of a spoon or a potato masher to release their juices. But I felt that this trick did not work for me. So I used an immersion blender to blend the berries at high speed until smooth. Strain the mixture using a fine mesh strainer until all the liquid is released. Save the pulp for smoothies. This juice can be stored in the fridge for up to 3 days, or can be frozen in small portions in sealed plastic bags or containers. This measurement yields 2 and 1/2 cups of Blueberry juice. In the original recipe for Blueberry Milk, only milk and the juice were mixed. But when I tasted it was definitely not sweet enough to persuade my son to drink it. So I decided to add some maple syrup. Using this blueberry juice, blueberry cola can be prepared by mixing equal portion of the juice and sparkling water. I made this too and it tasted awesome. We should definitely avoid giving carbonated drinks to children of all ages. But in this era of rigorous marketing and ads all around the place for Coke and Pepsi, it’s difficult to make the kids understand the effects of soda. So why not give them a cola which at least is not artificially flavored! Cherry and Strawberry juice can also be prepared in the above method and similarly flavored milk and cola can be made using the juice. But try to buy organic cherries and strawberries, because these fruits are on the “dirty dozen” list (Apple, Cherry, Grapes, Nectarine, Peaches, Pear, Raspberry, Strawberry, Bell Pepper, Celery, Potato and Spinach) , produce most contaminated with pesticide residues. These juices can be poured in ice pop molds and be frozen for a naturally flavored Popsicle. 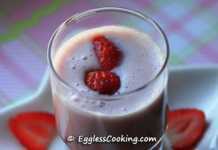 Care For Some Homemade Strawberry Milk? It looks very fresh. I will try to make it later for my wife. this is a good idea, I do something a little different. I freeze the berries after I clean them. When I’m ready to make the shake, I just add the frozen berries to milk and blend it with 1/2 a banana. You dont need to put any sugar when you do that and they get one more fruit. Thought you’d like to know. Thanks Divya. I too prepare a smoothie like that either with soy milk or silken tofu. But sometimes my son does not drink it if it has the skin of blueberries/strawberries. So this juice comes handy with picky eaters. looks colourful and yummy drink. looks delicious…its the same everwhere..its a big challenge for me everday to feed my 20 month old son!!!!!!! My daughter is the same too… I see many complaining about kids not eating healthy. Amma tells me I was worse than my daughter so she tells me to wait until she grows. Nice color of the milk. Will try this for my daughter. Oh no, i know how its difficult to manage picky eaters, its kinda a battle while dinning..am managing 4kids (3kids + my hubby) need to play daily with their favourite, fortunately they love anything with rice, cakes, shakes, cookies, Blueberry Milk looks delicious n colourful Madhu..
That drink is a beautiful colour. Its not easy getting children to have their food. And what works sometimes doesn’t all the time. I used to find that my daughter would eat without fuss if she had friends over. Now she’s 12 but is not ver keen on most fruits. So I convert them into shakes and ice-creams, cookies, muffins and cakes, make them look and sound exotic and she asks for seconds! Yes, my son was also a darling earlier. He wanted vegetable curry for each and every bite of food, but now he has totally given up veggies. OK…I empathize with ya. My son is 3 too (almost 4) and he has a mind of his own. He ate veggies and spicy masalas with gusto when he was a baby but right now he is just a fusspot. He has a major sweet tooth, so fruits and desserts are not a problem but veggies most certainly are. The only veggie he will eat is spinach (’cause he saw a few shows of Popoye on youtube, so he wants the muscles you see). Anyways, I think they just go thru phases. The blueberry milk sounds yummy though. And yes, I’ve glanced at that book..I think I do end up sneaking in a lot veggies in that manner too! Thanks for the comment on the Sindhi Masala Chole, I’m thrilled you guys liked it! I guess it’s universal, children not eating properly. I’m glad that I’m not alone. SM, you can try it with strawberries. I bought strawberries yesterday, will try it out today. Tell me about boys, they are not at all managable. Hi Madhu not only ur 3 years old son, my son is 7 years and do the same from the beginning 🙄 , so does his dad! I am managing two kids…. Cham, I thought only boys were like that. And I know what you are talking about your husband, because mine is also like that only. Lovely purple color… and very healthy too. Nice work Madhuram. Thanks Sweatha. I hope that they overcome this phase! Hi hi i had to smile when i read the post, when mydaughter was that age she was also like this ( she still is a picky eater) she used to go to my MIL place and eat things which she would not look at all in my place. The funny (or rather irritating) thing is, not only my son, it’s also my husband.